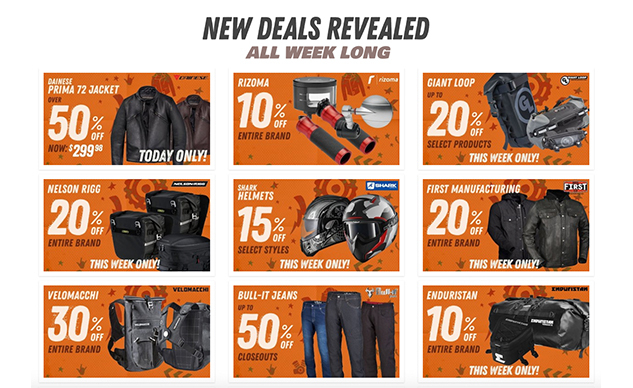 Honda NC700 Forum > Vendors > Vendor Deals > Revzilla is continuing the massive pre-holiday savings with "Orange Week Deals"
<p class="p1">It's flying under an odd name, but <span class="s1">Revzilla's new Orange Week Sale</span> is giving you yet another great excuse to shop for motorcycle gear in time for the holidays (whether for yourself or for others). They're blowing the doors off all sorts of moto apparel and accessories, with daily deals being added every 24h, and other deals lasting all the way through the week. Of the many deals on the list (<span class="s1">the full list can be found here</span>), here are some of the biggest savings we spotted so far.